Birthdate and place: December 10, 1944, Houston, Texas. Education: Galena Park High School, Sam Houston State University. Masters Track and Field Age Group Award (55 age group). 2004: Dallas Masters Track and Field Club. Female Field Athlete of the Year. 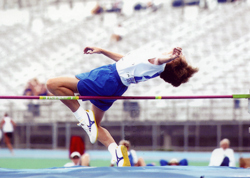 2005: Set new Senior Games High Jump Record. Gold in High Jump World Masters Games, Edmonton, Alberta. Dallas Masters Track and Field Club. Female Field Athlete of the Year. 2006: Second in High Jump, World Masters Indoor at Linz, Austria. 4th in the High Jump. 2010: Hayward Classic; Gold in High Jamp, Bronze in the Javelin. National Masters Outdoors Championship; Sacramento, California. Silver in the High Jump, Bronze in the Javelin. Linda is training for next year’s National Senior Games which will be held in Houston, Texas. She is also training for the National Masters and World Masters Track and Field Championship.